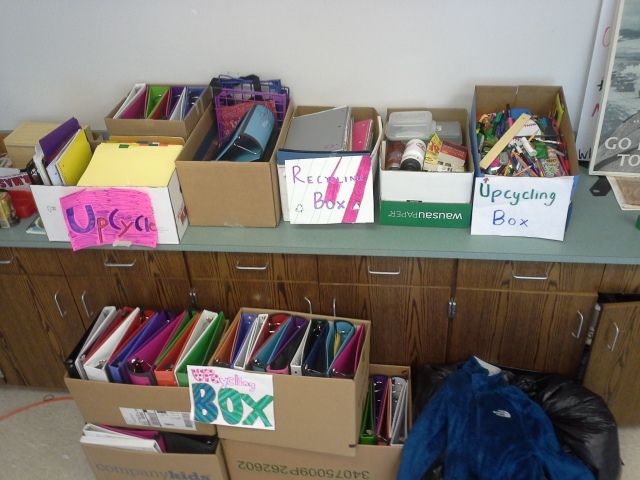 WMS Green Team members collected ten boxes of “upcycling” to send to a charity or needy school. For the second year in a row, the Wellesley Middle School (WMS) Green Team finished out their year of events with a “Locker Green-Out”. Now an annual event, the informal initiative aimed to maximize the waste saved and reused as middle school students cleaned out their lockers before summer vacation. This month a year ago, the team’s dream of making the locker clean-out more environmentally-friendly came to fruition. To combat the high levels of waste produced from the clean-out last year, the WMS Green Team implemented a system that paired a recycling bin with every trash can in the halls as students purged their lockers. Meanwhile, members of the Green Team encouraged their classmates to put any reusable school supplies in good condition, like binders or pencils, into “upcycling bins” instead of throwing them away. These items were then distributed throughout the school and given to students who needed them the following school year. This year, the WMS Green Team continued the “Green-Out” with the same system as they originally created, providing an equal ratio of trash cans to recycling and upcycling bins. The event was hugely successful, generating ten large boxes of reusable school supplies. Currently, the WMS Green Team are looking into possible homes for the collected “upcycling” other than at the Middle School. Some of the ideas include partnering with a school in Boston that has a greater need for the materials than a Wellesley one or donating the supplies to Cradles to Crayons. June 30, 2014 in News.